Wondershare iTransfer is a newly upgraded and low-cost application with more friendly user interfaces and enhanced performance. iTransfer is designed for users who need to transfer iPod/iPhone/iPad content to Windows PC without iTunes. It fully supports to transfer TV Show, Podcast, Audiobook and photos. Wondershare iTransfer supports all iPod/iPhone models including the latest iPod Nano 5G and iPod Touch 3G iPhone, iPhone OS 3.1. Turn your iPod/iPhone as portable hard disk You can treat your iPod/iPhone as a portable hard disk with iTransfer, and transfer PC to iPod/iPhone without using iTunes. Convert any videos to iPhone/iPod supported formats Unlike other iPhone/iPod Transfer applications, they can only transfer iPhone/iPod supported video and music file formats, Wonderhshare iTransfer can automatically convert videos and music to iPhone/iPod supported formats when you transfer file from PC to iPhone/iPod. So you can watch all videos and music on your iPhone/iPod. 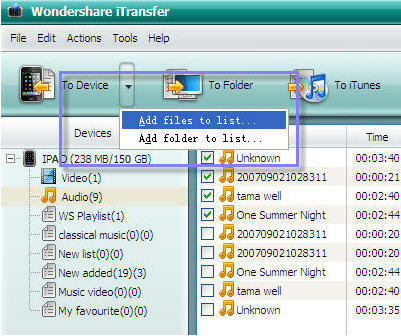 Wondershare iTransfer is also a great iPod/iPhone manager tool. It\'s easy to browse music/video files in your iPod/iPhone. You can organize playlist and digital collection with computer, such as creating new playlist, and deleting music. Wondershare iTransfer supports all iPod/iPhone models including the latest iPod Nano 5G and iPod Touch 3G iPhone, iPhone OS 3.1. Create flash movies (in swf extension) for the whole PowerPoint slideshow . Convert your digital photo and video slideshow movies to MP4 files. Convert digital photo and video to 3GP MP4 files. Qweas is providing links to Wondershare iTransfer 2.0.3 as a courtesy, and makes no representations regarding Wondershare iTransfer or any other applications or any information related thereto. Any questions, complaints or claims regarding this application Wondershare iTransfer 2.0.3 must be directed to the appropriate software vendor. You may click the publisher link of Wondershare iTransfer on the top of this page to get more details about the vendor.